A Living SchoolhouseWhat can you learn about BC from St. Ann’s Schoolhouse? What was it like going to school in a one-room schoolhouse? 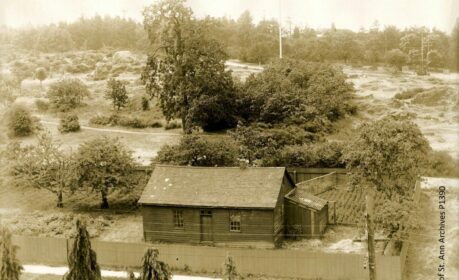 In the early days of British Columbia, many children were taught in one-room schoolhouses by religious organizations like the Sisters of St. Ann. In 1857, Roman Catholic Bishop Reverend Modeste Demers travelled to Quebec from Vancouver Island, to recruit volunteer teachers for the growing colony at Fort Victoria. The Sisters of St. Ann offered their full support, selecting four Sisters and a lay helper to make the trip. Leaving behind families and friends, the women travelled for two months by train and boat to Victoria, via New York, Havana, Panama and San Francisco. In 1858, the community of Fort Victoria first sent their children to the rough cabin that the Sisters operated as St. Ann’s Convent School. Early students included First Nations, Métis and those of African, English, French and Kanaka (Hawaiian) descent. Members of both the Protestant and Catholic church attended. Some children were from poor families and some from rich families, like the daughters of Dr. J.S. Helmcken and Governor James Douglas. The Sisters were educators, health care providers and social workers, as well as school and hospital administrators. The Sisters of St. Ann shaped the early school system in what would become the province of British Columbia. The schoolhouse they taught in was moved to the museum property in 1974, and is now part of the Cultural Precinct, on the east side of the museum. St. Ann’s Schoolhouse is a living schoolhouse open for school and public programs throughout the year. Find a virtual tour of the schoolhouse in look. Videos in watch tell behind the scenes stories, articles and links in read will get you going on your own research. What do you want to know about St. Ann’s Schoolhouse? 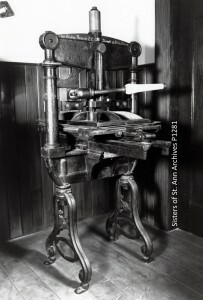 Read about BC's first printing press, which printed the prospectus announcing the opening of St. Ann's Schoolhouse. Explore other digital resources about one of the oldest buildings in western Canada. Watch videos about the opening and re-opening of St. Ann's Schoolhouse. Examine archival photographs documenting the long life of St. Ann's Schoolhouse.